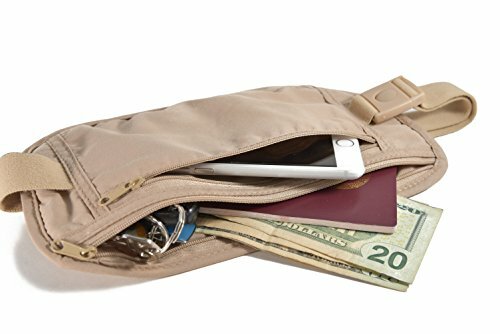 Rick Steves says "More secure than a travel wallet, money belts are your key to peace of mind. I never travel without one"
- Are you thinking of ways to keep your valuables safe, organized, and concealed as you travel, exercise, or encounter large crowds? - Are you looking for something that can be kept hidden and will be hard to access by thieves? - Are you having trouble finding a comfortable and durable solution to these problems? Introducing our very own Money Belt by Traveler's Peak! -Easy to adjust waist band to fit many sizes and will stay put once it is adjusted. -Strong and secure clasp to keep your money belt where it should be, hidden! -Breathable mesh backing helps make this money belt a comfortable choice. Our money belt waist pack is manufactured with your satisfaction and security as the top priority. Premium fabric, zippers, and reinforced edges make this money belt an easy choice. Available for a limited time at this discounted price. Be sure to click Buy Now so this money belt can be yours! Strong and secure clasp to keep your money belt where it should be, hidden! If you have any questions about this product by Traveler's Peak, contact us by completing and submitting the form below. If you are looking for a specif part number, please include it with your message.